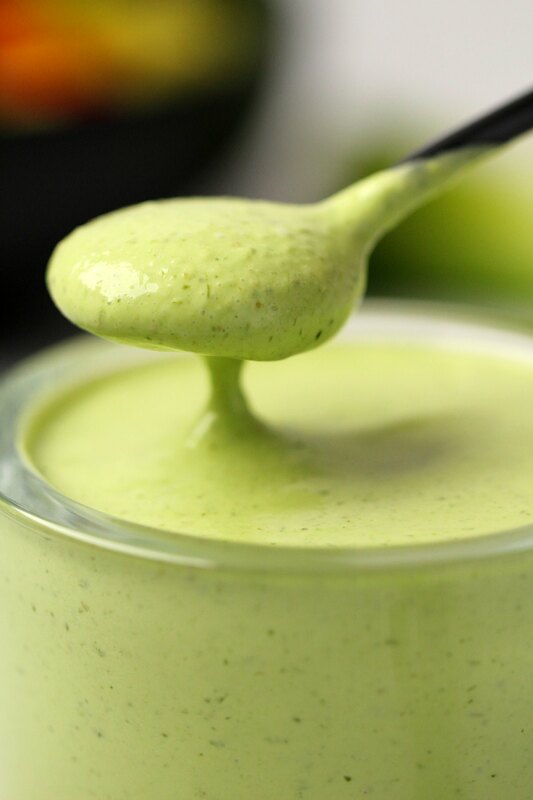 This was my first time making a vegan green goddess salad dressing and I realized I have been missing out big time. 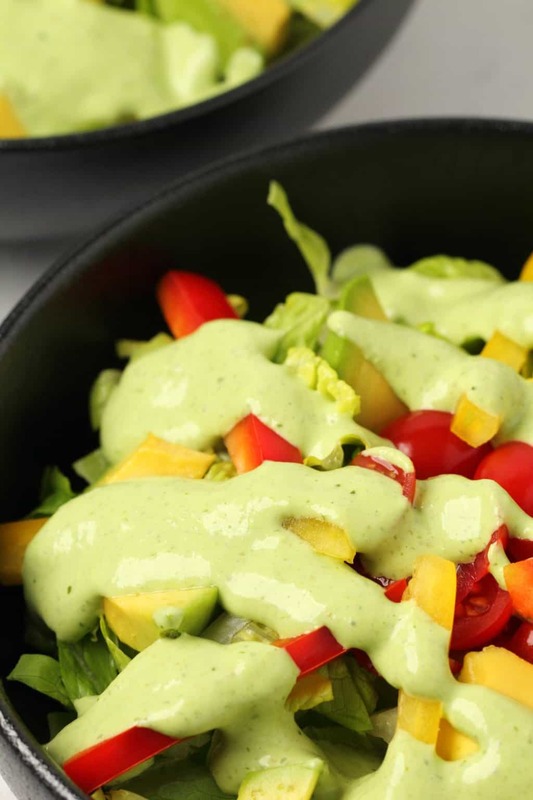 It’s a simply wonderful salad dressing with a beautifully vibrant green color. When I was doing my research, you know, finding out what it is, (cos when I first heard the name I had no idea! ), I read that it was somewhere between a caesar dressing and a ranch dressing. Well ah ha! 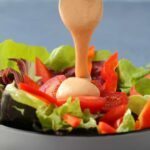 That explained it to me perfectly because I just happen to have a vegan caesar dressing and a vegan ranch dressing on this blog. So thinking of something in the middle between those two dressings, with some delicious greenery added in, well… I just knew exactly what I wanted to do. And this is now Jaye’s latest favorite thing and he is pouring mountains of it over everything! 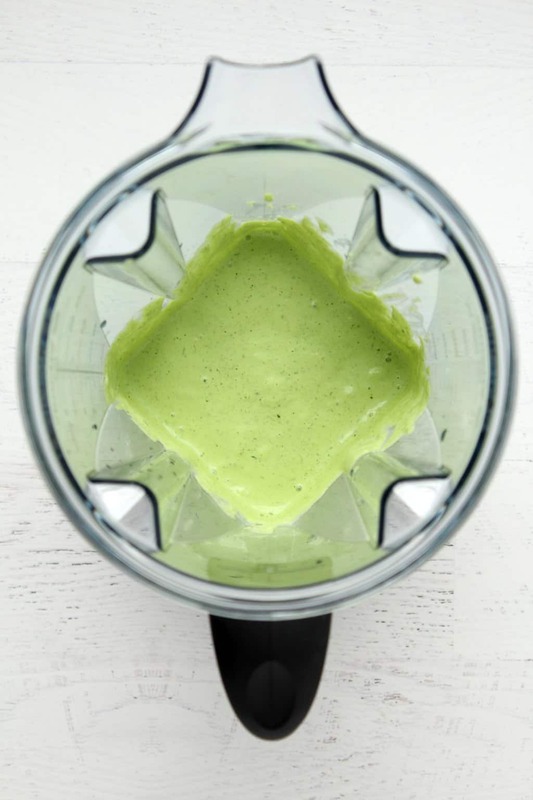 You add all the ingredients to the blender and blend! Voila! It’s a simple mix of vegan mayonnaise, homemade vegan buttermilk (lemon juice with soy milk), fresh lime juice, capers, crushed garlic, salt, fresh cilantro, fresh basil, spring onions, fresh chopped chives and a little white vinegar and maple syrup. 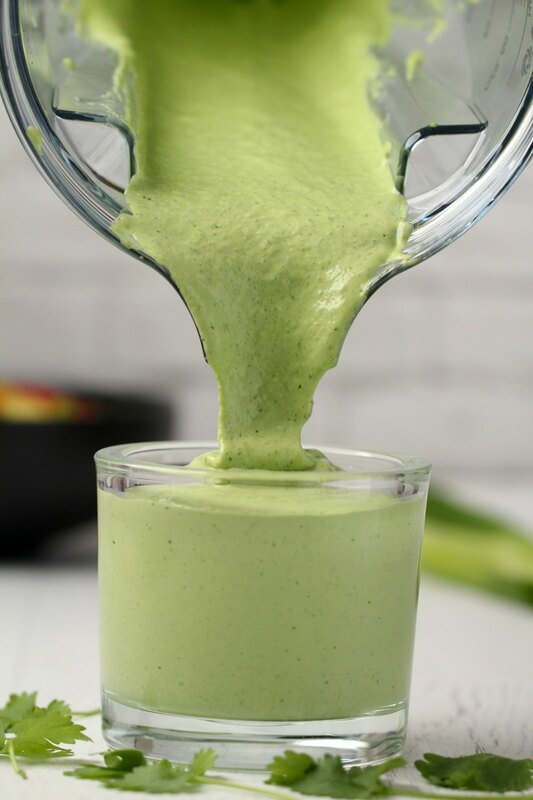 Blend it until smooth and then pour out into a container and use as a salad dressing or dip or topping for the next few days. 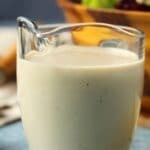 Can I use almond milk to make the vegan buttermilk? Yes you can. 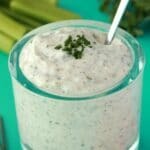 Almond milk works fine to make buttermilk but the consistency is a little thinner than soy milk so this might make your dressing a little thinner, but this won’t be a problem on this recipe. Should the soy or almond milk be sweetened or unsweetened to make the vegan buttermilk? Either or is usually fine! 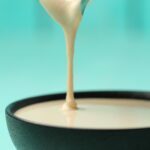 I usually have regular sweetened soy milk around and use that. The brand I use doesn’t taste sweet though. If you have a soy milk brand that has a noticeably sweet taste then rather use an unsweetened variety. Can I use lemon juice instead of lime juice? You can, it will of course alter the flavor profile slightly, but not in a bad way. Can I leave out the capers? Of course if you can’t find them anywhere then sure. But if you can get them, they definitely add heaps of flavor here! This is the crossover from our vegan caesar dressing and the capers really do pack a flavor punch. What are spring onions? They might be called salad onions or green onions or maybe even scallions where you are. Can I use apple cider vinegar instead of white vinegar? 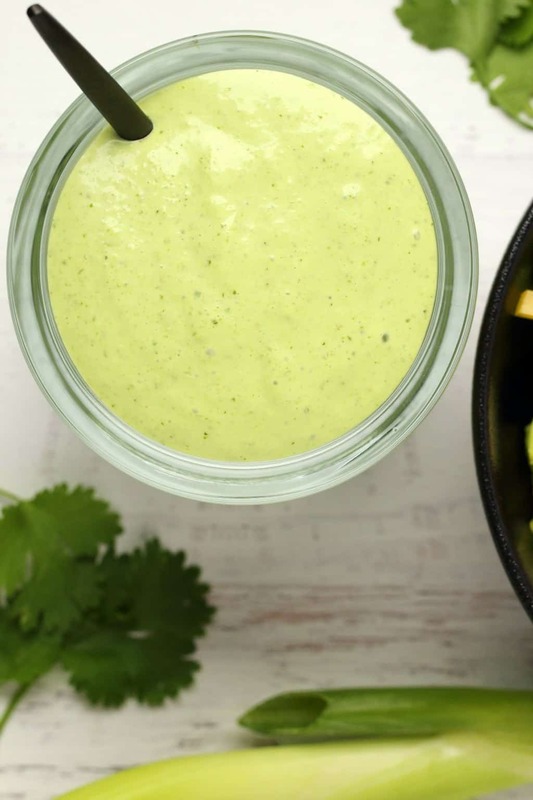 You can, but white vinegar is much better tasting in this dressing. So try and get it if you can. Why is maple syrup added? We use a tiny amount (just 1 tsp) to cut those savory flavors just right. You won’t even notice that it’s there, but it just makes the whole dressing come alive. Can I use different fresh herbs? Sure! Parsley is good for this as well. If you’re a person who doesn’t like cilantro, switch it for parsley. And of course, experiment, any fresh green herbs could be delicious in this you’ll just have to try it and see. Keep it stored in the fridge and enjoy within around 5 days. 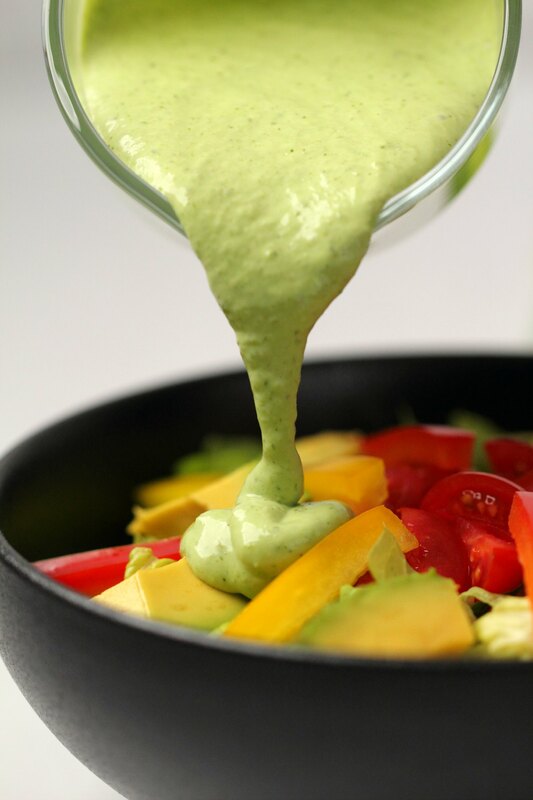 Our tahini salad dressing is something you’ll totally fall in love with as is our tahini sauce! 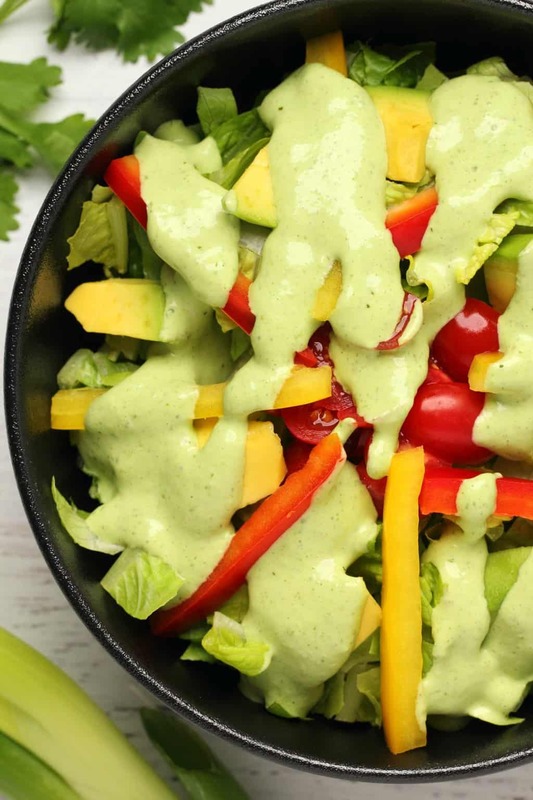 Yes, two different recipes for tahini dressings because that’s how much we love tahini. 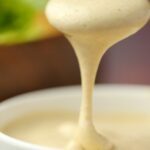 You can even make your own vegan mayo and we have a great recipe for you and our vegan thousand island is wonderful as a dressing or a dip. 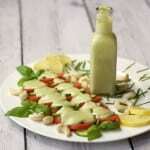 Our vegan aioli is another recipe you won’t want to miss as is our cashew cream. 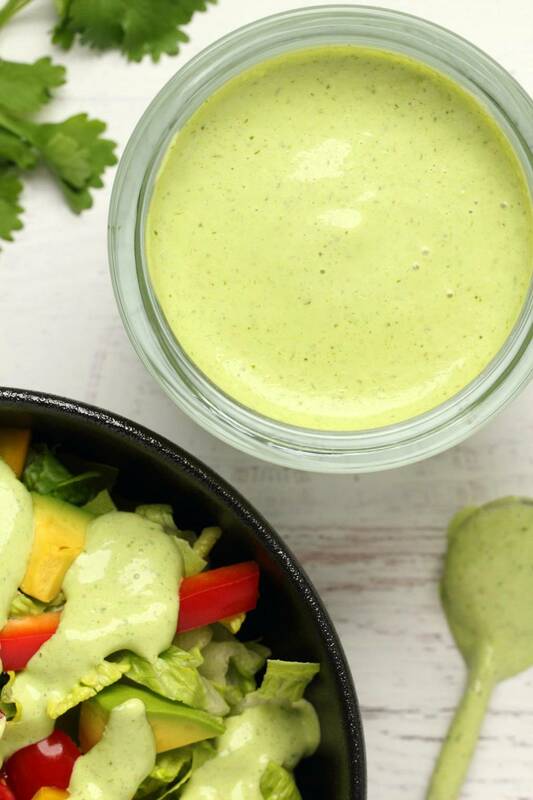 So let us know what you think of this vegan green goddess dressing in the comments and please rate the recipe too. Sign up to our email list while you’re here. We’ll send you a gorgeous recipe ebook containing 10 delicious dinner recipes, and you’ll be the first to know when new recipes are posted to the blog. 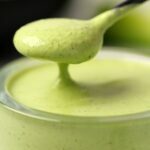 Creamy vegan green goddess dressing. Vibrantly colorful and packed with fresh herbs. Super easy to make and divine on any salad! 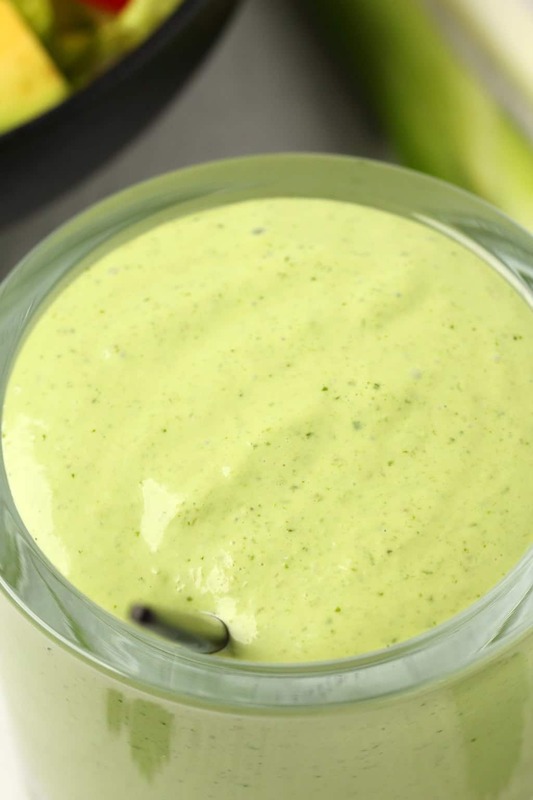 Add the vegan mayonnaise to the blender jug. Mix up the vegan buttermilk by adding 1 tsp of lemon juice to a measuring jug and then adding soy milk up to the 1/4 cup (60ml) line. 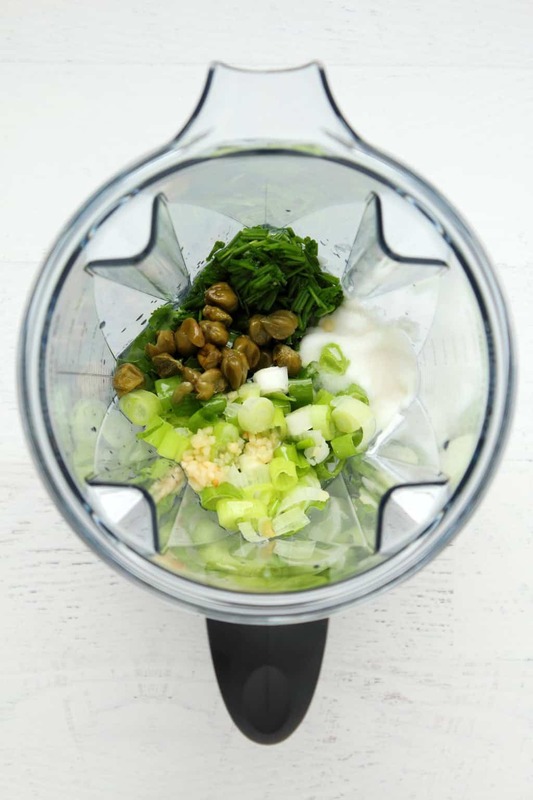 Add the vegan buttermilk to the to the blender jug along with the lime juice, capers, crushed garlic, salt, fresh cilantro, fresh basil, chopped chives, chopped spring onions, white vinegar and maple syrup. 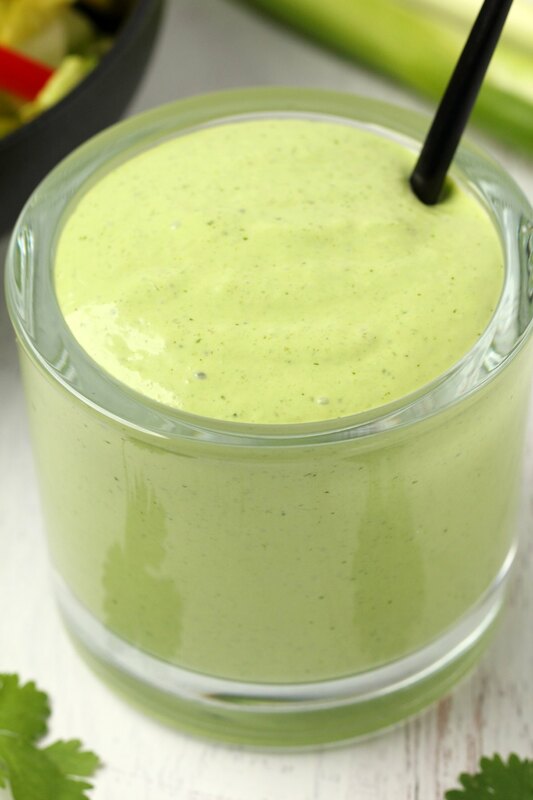 *You can make the vegan buttermilk with almond milk too, but it will result in a slightly thinner consistency for your dressing. This is totally yum! Brings your salad to life!